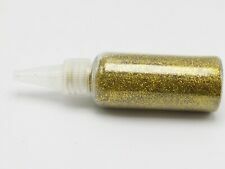 A Pack of 12 Different Colors Glitter Powder. 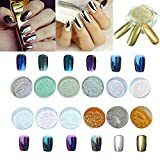 Perfect for natural nails, false nails, acrylic Nail, eyes. Make your nails look colorful and shiny, Suitable for nail salon, nail art school / college, personal use, wholesale, etc. Create Colorful and Personalized Effect. Can be mixed with nail polish for glittery party nails, with this set, you will be more attractive!. 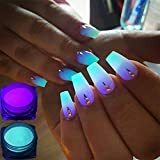 Nail Fluorescent powder makes your nails more beautiful in the dark. Good choice to apply on your nails.. 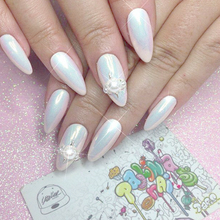 Different powder makes different shiny and laser effect..
Clean the surface of your nails, brush the base polish, and place it onto nails. Seal with a clear topcoat. * TOOGOO is a registered trademark. ONLY Authorized seller of TOOGOO can sell under TOOGOO listings.Our products will enhance your experience to unparalleled inspiration. TOOGOO(R) 12boxes/set Neon Phosphor Powder Nail Glitter Powder 12 Colors Dust Luminous PiGMent Fluorescent Powder Nail Glitters Glow in the Dark Specification :Weight: Approx 2g/boxMaterial: PowderColor: As the pictureIntroduction: The luminous effect depends on how long it takes for you to light up during the day. Luminous powder is like a battery. The longer it lasts, the longer it will last. Absorb light for 10-30 minutes in the bright place, you can continue to shine in the dark for several hours or more.Package:1 X 12boxes/set Nail Fluorescent powderOnly the above package content, other products are not included.Note: Light shooting and different displays may cause the color of the item in the picture a little different from the real thing. The measurement allowed error is +/- 1-3cm. These colors may be used to make 3D nail art or mixed with glitters or overlaid with shell/ opal flakes for outstanding results.. 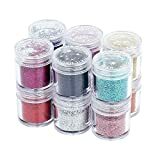 Create colorful and personalized effect, you can make different colors combinations and creat more imaginative nail art decoration..
18 Plain colored acrylic nail powder in pot, Varying colors of plain acrylic powders in an individual clear jars with screw-on lids..
Set includes 12 boxes of nail glitter powders. Package Include:12 boxes Nail powder.